Research shows that students who are engaged in learning demonstrate greater success in school, which may in turn lead to better student attendance as well as fewer incidents of misbehavior. After thousands of classroom observations, we have witnessed many teachers lecturing for 20-30 minutes at a time, or reviewing problem after problem, and not allowing any (or very minimal) student interaction or discussion. The lack of opportunity to engage with the content causes most students to “check out” or veer off track. At DataWORKS, our Great Initial First Teaching (GIFT) philosophy requires that students be fully engaged in the initial classroom instruction. Therefore, we developed a set of Engagement Norms that teachers can easily implement in their classrooms to make sure that students are constantly being involved in the lesson. DataWORKS Engagement Norms aim to focus teachers on incorporating specific student engagement strategies on a regular basis (approximately every one to two minutes). Thus, students stay on track and do not have the opportunity to misbehave because they are constantly being asked to do something. Our Engagement Norms start with four “Do with me” strategies that ask students to rehearse a new word, a phrase, or a gesture along with the teacher. The first norm, Pronounce With Me, helps students to read new words that they may not be familiar with. Teachers can use Pronounce With Me to introduce new Academic or Content Vocabulary ensuring that students hear the correct pronunciation of new grade-specific vocabulary before reading it themselves. The second norm, Track With Me, helps students connect oral words with the written words. Teachers pre-read sentences while students are pointing to the words on their papers or on the screen. This way they are familiar with the words before asking the students to read it chorally. It’s amazing how everyone can read if the teacher reads first. The third norm, Read With Me, supports students with choral reading of text. The teacher cues the students to read chorally the same text that they just tracked. Generally, the teacher reads along with the students to set the pace and to keep everyone together. There are also variations for different grade levels. For example, a teacher may ask students to “Pronounce With Me” while he reads the word: Photosynthesis. Then he will ask the students to “Track With Me” while he reads: Photosynthesis. If the teacher notices that the students are still mispronouncing the word, he can ask students to “Track With Me” again. He will ask students to listen closely and track while he reads it for them again. Finally, he would ask them to “Read With Me” a final time to insure correct pronunciation. Norm number four asks students to Gesture With Me. Gesturing can be a great cognitive strategy to help students store information in long-term memory. Even when students are struggling to remember a specific bit of information, they can often remember the gesture associated with it, which may ultimately help them recall the information. The fifth norm is Pair-Share. Pair-sharing is vital to student engagement. It gives students the opportunity to orally answer the question (which as a cognitive strategy means they have a greater chance of storing the information in long-term memory). It also helps them rehearse their response (especially important for English learners), and it also provides an opportunity for them to academically converse with their peers. This signal not only gains student attention, but it ensures that they are looking at the teacher and sitting up, ready to learn. Norm number seven is Whiteboards! Whiteboards are a great way to Check For Understanding and ensure that every student is learning and working! Writing responses on Whiteboards gives the teacher the chance to quickly glance around the room and see how many students have an incorrect answer and, if necessary, reteach. 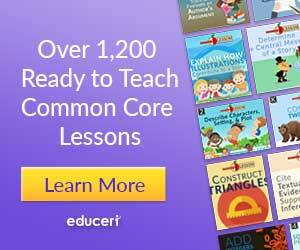 It is a real-time assessment of students’ understanding. DataWORKS asks students to “Chin-it” when holding their Whiteboards up for the teacher to see. This means they hold the Whiteboard just under their chin, facing the teacher – ensuring their whiteboard is not blocking the view of other students. The final norm may just be the most important – Complete Sentences. Asking the students to respond in Complete Sentences means they are really making connections with what they are learning. It provides practice in saying new words defined earlier in the lesson, using them in meaningful context, and hearing them being used by others. For example, if the answer to a perimeter problem is 42 feet, the typical response from students will be: “Forty-two!” But when we ask them to use a Complete Sentence, they are forced to incorporate newly learned Academic and Content Vocabulary, and they are practicing using their public speaking voice – a very important skill for college and career! Student responses are now: “The perimeter, or the distance around the park, is 42 feet.” Now you know students are conceptually learning what they are doing! 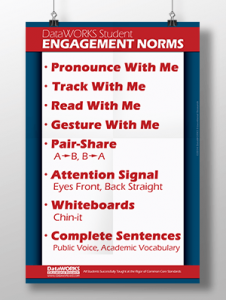 Engagement Norms are a great addition to any classroom. Just remember, student engagement is created when the teacher asks the students to DO SOMETHING! If you’d like to increase attendance, minimize behavioral problems, and help students learn more and faster, then check out how our Instructional Leadership Workshop can help you implement these Engagement Norms in your school. Schedule a webinar today using our form. Is there a preferred time to contact you? PreviousPrevious post:Intro BlogNextNext post:What Does Technology in the Classroom Mean?